Francesca Versace as a spokesperson for Convivio charity event, 2014. CONVIVIO – founded in 1992 by Gianni Versace, with support of legends of design Gianfranco Ferre, Valentino and Giorgio Armani, Convivio is an auction that takes place in Italy each year to raise money for ANLAIDS: Associazione Nazionale per la lotta contro l’AIDS. For over twenty years, the charity has worked tirelessly in research and prevention of the disease, additionally providing psychological and palliative support and raising awareness. Each year, designers from all over the globe donate their products to be sold at 50% of the retail price in order. Convivio is not only ‘shopping for a good purpose’; Convivio is an opportunity to act. Francesca Versace as a testimonial for Convivio charity event, 2012. CONVIVIO – founded in 1992 by Gianni Versace, with support of legends of design Gianfranco Ferre, Valentino and Giorgio Armani, Convivio is an auction that takes place in Italy each year to raise money for ANLAIDS: Associazione Nazionale per la lotta contro l’AIDS. For over twenty years, the charity has worked tirelessly in research and prevention of the disease, additionally providing psychological and palliative support and raising awareness. Each year, designers from all over the globe donate their products to be sold at 50% of the retail price in order. Convivio is not only ‘shopping for a good purpose’; Convivio is an opportunity to act. 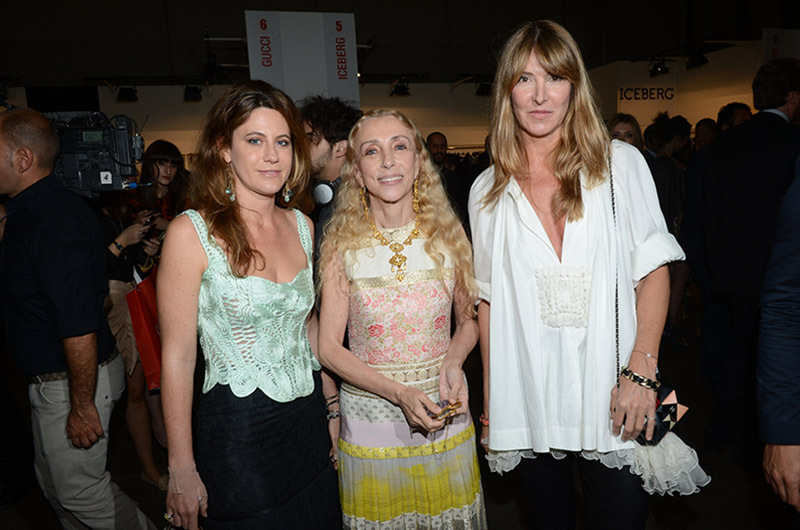 Francesca Versace, Franca Sozzani and Cristina Tardito attend Convivio charity gala event 2012 in Milan. CONVIVIO – founded in 1992 by Gianni Versace, with support of legends of design Gianfranco Ferre, Valentino and Giorgio Armani, Convivio is an auction that takes place in Italy each year to raise money for ANLAIDS: Associazione Nazionale per la lotta contro l’AIDS. For over twenty years, the charity has worked tirelessly in research and prevention of the disease, additionally providing psychological and palliative support and raising awareness. Each year, designers from all over the globe donate their products to be sold at 50% of the retail price in order. Convivio is not only ‘shopping for a good purpose’; Convivio is an opportunity to act. Eva Herzigova, Francesca Versace and Franca Sozzani launch "A new Home for Convivio"pop up store at Fidenza Village , 2010. CONVIVIO – founded in 1992 by Gianni Versace, with support of legends of design Gianfranco Ferre, Valentino and Giorgio Armani, Convivio is an auction that takes place in Italy each year to raise money for ANLAIDS: Associazione Nazionale per la lotta contro l’AIDS. For over twenty years, the charity has worked tirelessly in research and prevention of the disease, additionally providing psychological and palliative support and raising awareness. Each year, designers from all over the globe donate their products to be sold at 50% of the retail price in order. Convivio is not only ‘shopping for a good purpose’; Convivio is an opportunity to act. Francesca Versace shopping at Convivio 10th gala event, 2012. CONVIVIO – founded in 1992 by Gianni Versace, with support of legends of design Gianfranco Ferre, Valentino and Giorgio Armani, Convivio is an auction that takes place in Italy each year to raise money for ANLAIDS: Associazione Nazionale per la lotta contro l’AIDS. For over twenty years, the charity has worked tirelessly in research and prevention of the disease, additionally providing psychological and palliative support and raising awareness. Each year, designers from all over the globe donate their products to be sold at 50% of the retail price in order. Convivio is not only ‘shopping for a good purpose’; Convivio is an opportunity to act.